> This is Constance displaying her tie and dye. We bought several samples to develop some products using these fabrics. Her eye for color and design is great. Constance is a widow and a single parent. Her husband, who died two years ago, was an artist, as is she and 4 out of 5 of her children. 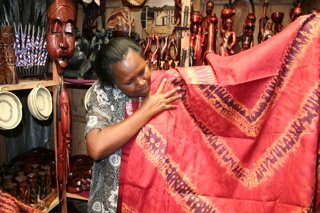 Her shop was in the Kigali artists cooperative complex. Being the sharp business woman that she is, she immediately began discussing my talk about merchandising and space allocation showing me around her shop and telling me what items were the most profitable for her and where she was wasting space. She definitely was listening in the training and was already moving things around. 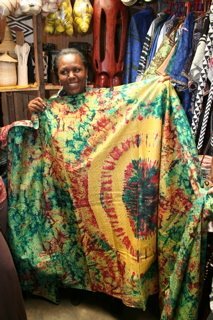 Her passion and desire is to open a womens' cooperative, training them to use this dye process, and she already owns the plot of land and was telling me about her 100 day plan and her success map. We enjoyed seeing her jewelry designs and paper beads made into jewelry. She wants to teach street children a skill and assist to get them off of the street. We talked about vegetable dyes and different dying techniques. We had several ideas for her cooperative that we are taking back to her mentor in the US. These women are amazing and inspiring. They are planning a dinner for us tonight, which we are looking forward to. We couldn't visit each business but hope to next visit.